Download the March 2014 Edition of The Profit Newsletter Now! The March 2014 edition of The Profit Newsletter is now available for download. You can download The Profit Newsletter as a High Quality PDF (Recommended) or Low Res PDF for slower devices. The Profit Newsletter is the official newsletter of the Tampa Real Estate Investors Alliance and is a digital, interactive newsletter for new and seasoned real estate investors delivered as an Adobe PDF file to read on your PC, Mac, Smart Phone, iPad or other mobile ready devices with a PDF reader. Many of the articles and ads in The Profit contain hyperlinks you can click or tap to visit websites, watch videos, listen to audios, download content, send emails, comment on articles, share socially and much more! The high res version of The Profit is “print ready” for those who want to print the newsletter on their home or business printer. Also, be sure to Subscribe to The Profit so you don’t miss a single monthly issue. If You Don’t REACT To The Real Estate Market, You Won’t Last In This Business! Since buying our first property back in 1978, we have seen many changes in the Real Estate market. As you know, Real Estate is very cyclical. Markets come and go and believe it or not, come again. We used Options, Lease/Options, Rehabs, Private Money back then, in the 80’s, 90’s, and since then. Sometimes these techniques can be used in the same cycles, and sometimes only a few will work. When the market changed back in 2006 and it turned down, a new cycle began…again. In a matter of about 10 days we saw about 13 exit strategies disappear right in front of our eyes. Market values plunged. Sellers still wanted pre-2006 pricing. Our six figure per month income just about dried up. What do you do? Well, you adjust to the market and find what works now or your business dies! So we started doing Short Sales. We had been doing short sales for years, way before most people even knew the term short sale. We did hundreds of short sales. 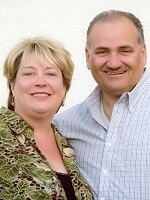 The only problem was that we could not help all home owners who needed a short sale. Plus as you probably know, short sales are anything but short. For centuries the courts have been rigged in favor of the banks. The banks have the kind of time and money that homeowners could never dream of, and they are more than willing to use both to get their way. You’d be wrong, however, to think that’s the only way the system was crooked. If a homeowner whose loan was securitized tried to force the bank to show the chain of title, the court would tell the homeowner that they didn’t have standing to make that demand. The homeowner then is left with no way of proving that the foreclosing bank/entity does not have the authority to foreclose. Not anymore! In the case of Steinberger v OneWest Bank, et al, the court ruled in a special action that the homeowner does have the standing to demand that the foreclosing bank/entity provide a securitization timeline in order to establish their claim of authority to foreclose. This timeline of assignments and transfers would prove whether or not assignments were made after a note had already been transferred to a securitized trust and could be declared invalid. In the first two parts of this article, we covered a few nice things like wholesaling, when & why you might not do a deal, and then how to make money even when you don’t buy a house. The big secret I revealed in the last article was: You SELL the leads of the houses you don’t buy. Now Your Question Is: “Ok. It makes sense! But HOW do I sell these leads?” Good question! Again, let’s keep this simple. I suppose you could go and build a squeeze page, make a sales funnel, put up ads on Facebook or Adwords, etc. But don’t. Please. What a waste of time – especially at this point. Let’s keep it simple, ok? Instead, why not just make a few phone calls to some of these local people? Ring a few Realtors. Call a couple of contractors. Get the Interest of some Investors. Dude – Dial for some Dollars! There is money to be made in real estate, but you need to think about real estate investing as the business it is. Allow me to share some common mistakes that beginning and even seasoned investors should avoid. For those of you connected to REIAComps, the control and feeling of confidence you have over your deals is priceless. Using REIAComps to investigate the value of houses as they come to market, against the recent sold comparables, will provide you a solid position to “make your profit when you buy”. Getting emotionally involved. This is the biggest and most common mistake beginning investors make. Emotions and business do not mix well. Paying too much. To make money investing, you have to find a good deal. Look for properties that need a little fixing up. Your goal is to find a distressed property that you can purchase at 60- 70 percent of other sold comparables. REIAComps makes that part of your investing business much easier. Investors get into the real estate business to become ‘Millionaires,’ however, many listen to courses that contain outdated information where the systems are no longer working. They follow the wrong advice which seriously stalls a successful kick start. This industry is changing monthly; be sure your trainings are coming from a Mentor who is out doing deals on a consistent basis. I stand firm on my philosophy of “Don’t quit your job until you have at least one year salary in the bank.” Why, you ask? Because it puts unnecessary pressure on many marriages, families and individuals when they quit their job and the deals are not consistently coming in yet. I not only teach Short Sales, I also teach how to buy, hold, flip, subject to’s, lease option techniques, etc., which allow you, the Investors, to truly understand all of your available exit strategies. There’s no doubt that the number of properties being advertised for foreclosure has been plummeting for the past year and a half. The question is, why? In 2009, when foreclosure numbers began to skyrocket, the only way a bank could deal with borrowers who were behind on their mortgages was to foreclose. The fact that banks – actually it was loan servicers like the infamous MERS – didn’t have possession of the borrower’s note, nor the legal right to foreclose on the property, is a topic for judges and attorneys. At the same time, you had thousands of borrowers who, because they couldn’t/wouldn’t make their mortgage payments, simply “gave the house back” and walked away. (It didn’t matter to the borrowers that the bank didn’t give them a house; it gave them money…and the bank – rightfully so – wanted their money back, not a house.) A bank’s only tool to deal with this situation was to foreclose on the property, and then sell it in hopes of recouping some of their loss. You and/or your client have found real estate to purchase. The inspections go beautifully and then a giant road block shows up. What’s the road block? Your client wants to purchase it with their Self-Directed IRA and their IRA can’t qualify for a non-recourse loan because it doesn’t have the cash reserves for the 35% down payment the non-recourse lender is requiring. Self-Directed IRA investors have a technique they call “Subject To” that can solve this funding problem. The “Subject To” loan qualifies as a non-recourse loan and can be used to purchase real estate within a Self-Directed IRA. It should be noted that the “Subject To” method can be used for deals whether the property is being purchased by an individual or by their IRA. As a beginning real estate investor, what is it that we are getting into real estate investing for? Have you figured out what that is yet? Is it because you just love real estate? You love it so much that you would do it for free right? Probably not, but it is a means to an end and for many people including myself. We see it as a quicker, more effective, and more realistic means to an end than other options (ex: our traditional 9 to 5). But when you say means to and “end”, what is that “end”? Is that a clearly defined destination for you? Is it retirement? If so, what does retirement look like for you? Is it financial freedom? If so, what does financial freedom look like for you? Is it a net worth of a certain amount of money? Is it a passive income of a certain amount of money each month? Is it a house on the water, a big boat, lots of nice cars, lots of vacations? Is it simply Time Freedom – being able to do whatever you want with your time, because your bills are paid, and everything else is taken care of? I want you to be wealthy. I want you to make $5000 in the next 30 days. I know I can show you how. So every month, I explain how to navigate the very real possibilities in the real estate market. I encourage you to get out and beat the bushes for motivated sellers because I know they are out there and they are ready, willing, and able to sell to you. This month I want to explain how you can avoid real estate ditches, potholes, and blunders. Believe me, I have found them through trial and error, and my experience can help you to avoid them. Not following your business model. Buying with someone else’s numbers. Buying from a control freak realtor. Last month I mentioned I had discovered that every property I drove past was one of four different types of houses every investor needs to be able to quickly recognize if they want to increase their bottom line every year. This month I will explain two types of houses that can really increase your income every year. Okay, now we are out at the house. Next step is to ask the seller if you can take a quick look around, and do just that. I don’t spend more than three minutes walking through the house, taking a look at it. Please do not make any com­ments if you see anything wrong with the house. You’re not there to downgrade the house. You’re there to either buy it or lease option it, and you don’t do that by upset­ting the seller. I’m sure that most sellers are clearly aware that their walls need painted or whatever you see, they can see as well. Once you’ve looked around, the next step is to ask them if they have any questions. You’d be surprised what happens when you let them do the talking and you not doing the seminaring. Simply ask them if they have any questions. If they do, answer them shortly, to the point, but simply enough so that anyone can understand them. I got into the real estate investing business to have more free time for myself and my family and to have the financial freedom to do whatever I wanted, whenever I wanted. I wanted my life to be more worry free. I have spent a great deal of time accomplishing that goal and I want to share some of my insights with you as a real estate entrepreneur. When you decide to become a Real Estate Investor, make sure you structure your business in such a way that it doesn’t become overwhelming, even more so than a full time job could be. It’s very easy to fall into that trap, especially if you work from home. You can also fall into the trap of trying to do everything yourself, and long-term, this just won’t work. Believe me when I tell you that most tasks in your business need to be delegated to others starting with your marketing. Last week my Aunt Blanche came to dinner and told us all about a class she was taking: Financial Markets, at Yale. Really? THE Yale? Blanche is pretty imaginative, so I thought she was making it up. Sure enough, though, she proved it: She’s got a certificate in Financial Markets from Yale University. I have to admit I was impressed. It had to have taken work and dedication, and, I imagined, lots of money, too. That got me thinking about how important it is to invest in ourselves, particularly in our own education. So many of us think we don’t have the time or money to spend on ourselves. We feel overwhelmed just facing the details and expenses of daily life. In my experience, though, learning something new gives me new energy and motivation to spend on all the mundane stuff. Are you sitting on a ton of cash and you are not sure what to do with it? Do you need to find a real estate investment to put all that cash into? Are you struggling to find a deal that will give you a good ROI on all that cash you have laying around? Or does this describe you…? Do you need to find some cash to do your real estate deals? Are you trying to figure out how to get your deals funded? Are you looking for partners to help with the cash to get started or perhaps you are looking for a “no money down” deal to get you going? If the second description is you then you are not a real estate investor…you are a real estate entrepreneur! You are a real estate business owner, not an investor and there is a BIG difference. An investor is someone that fits the first description. An investor already has a lot of cash and needs to put it into a deal to get a return on all that money they have laying around. Is REACT Worth Your Time and Effort? OK, so if you have no competition, unlimited leads, and qualified, cash, and credit challenged buyers with money down, how can you lose? If you made just $5,000 per deal and did one deal per month, would that change your life? What if you did one deal per week? 4 Deals x $5,000 = $20,000! What if you made an average of $10,000/Deal? 4 Deals x $10,000 = $40,000! I think you can see where we are going with this. We know of one person we coached that is doing 3-4 Deals per week with an average of $12,500 per Deal! Back in 2007 when the Real Estate market was crashing is when this and another concept called “ACTS” was created by Steph and I. We had to find something that worked. So these techniques were born out of necessity. None of the techniques we had been taught and used for years were working. They all dried up overnight. So we went back to basics… options, lease/options with a new twist. The beauty of REACT is that it will work in a down market, an up market, and a sideways market. REACT works with no money, no credit. Motivated Sellers are an option, not a necessity… Think about that one! So, if you want an unlimited supply of leads, where every one of them WANTS to sell, you do not want to miss this Workshop. REACT is the latest and greatest technique to hit Real Estate Investing in decades. Now we will tell you this, you have to be taught and you have to do it correctly. This is why you have to come to the workshop and get this training. Once you learn REACT, you can take the housing market by storm. Together we can correct the down turn that the government can’t. A Bold New Concept Called “REACT” That Will Totally Eliminate Your Competition! Tampa REIA is excited to announce that Jon & Stephanie Iannotti will be our special guest trainers this month on Thursday, March 13th at 6PM at the Doubletree Suites Tampa Bay located at 3050 North Rocky Point Dr West in Tampa, FL. 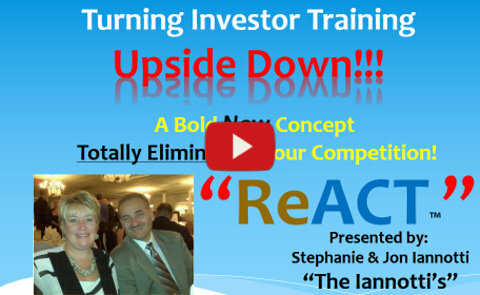 The Iannotti’s, who are the creators of “ACT” (Assignment of Contract and Terms), are turning real estate investor training upside down with a bold new strategy they call “REACT”. How to make money with no Credit, Money or Contractors. How to do as many deals per month as you want. How to make minimum $5,000 per deal. How to get the benefits of ownership without owning. How to put it all on ‘Cruise Control’.